In May 2018, Judge Neels Claassen, (Chairman of SAMLA) asked me to meet with a highly esteemed gentleman from India who was interested in our medico-legal association, as he himself was one of the founders of the Indian Medico-Legal and Ethics Association. Professor Rajesh Shah, his lovely wife Dr Parul Shah and his daughters, Nirzari and Nisargi, and I met one afternoon in their hotel in Cape Town. As the Western Cape Branch-Chair of SAMLA I needed to be the ambassador of our association and try, in a short amount of time, to give my guests an abridged overview of SAMLA’s ideals, plans, achievements and concerns. 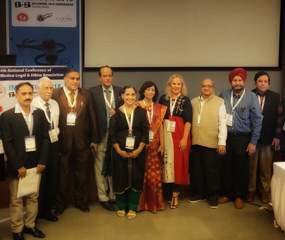 It was immediately apparent that our two countries, South Africa and India had a number of very similar medico-legal challenges, these were touched upon but the time we had together was simply not enough to even scratch the surface. A few weeks later I received an invitation to join IMLEA for a conference at the end of 2018 in Ahmedabad, India. Travelling to India seemed financially impossible but SAMLA then agreed to sponsor my flights and IMLEA my accommodation which made this all possible. 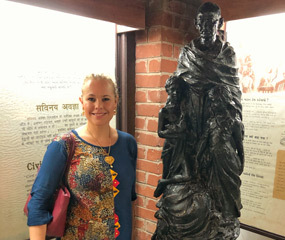 When I arrived in Ahmedabad, India I learned that this was the home of the great Mahatma Gandhi after his return from South Africa. Immediately a rapport was established in a city that homed our mutual peace icon and hero. 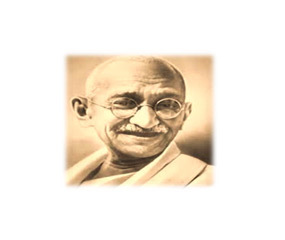 Mahatma Ghandi knew the law and used it along with sheer grit, determination and bravery, to right wrongs in a manner that was simply astounding. As a lawyer specialising in medical law, you are sometimes faced with very conflicting feelings and ideals: Two parties, no ill intent, entering a patient-physician relationship on a good footing, void of culpa - suddenly…. upheaval, hate, secrecy and blame; an intense juxtaposition which could in most (if not all) circumstances be circumvented by clear, simple, open communication. 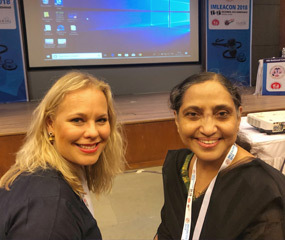 The first day of the conference - Ahmedabad continued to delight: I saw all the familiar faces that I met in Cape Town and felt right at home. As the conference continued, one astonishing fact came to light, having a medical degree and a law degree was the norm here. In India, a medico-legal expert was in essence exactly that, a person highly qualified in both medicine and the law. In speaking to a few of these highly qualified individuals, a common thread was that they wanted the “other” degree so that they can properly and professionally assist their colleagues in inquests, litigation or disciplinary proceedings. It came as a great shock to me that doctors in India are being physically and emotionally assaulted by their patients or the patient’s family in India. I cannot imagine that amidst the long hours, the constant battle for resources, the noise, illness and continual suffering, that a doctor now needs to fear for his/her life when trying to save lives. 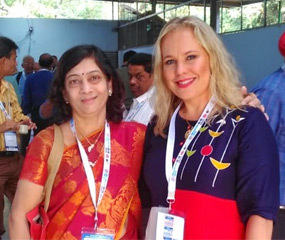 Drs Tripathi and Yagnick, on the opinion page of the BMJ on 13 December 2018 (https://blogs.bmj.com/bmj/2018/12/13/violence-doctors-india-treatment-no-longer-us-them/) approximate that 75% of doctors face verbal and physical abuse. Their observation of this situation is that it is as much the physicians’ responsibility as it is the public’s responsibility to make changes to curb this; - Physicians need to be taught how to interact with their patients on a level that does not insight aggression, be more empathetic and sensitive to cultural bias and the public’s expectations. Conversely, the public is being indoctrinated by media billboards and adverts of medical negligence, which serves to only demean the doctor further and results in a lack of respect and trust of the doctor. Another concerning conundrum in India is the use of the Consumer Protection Act (CPS) in medical negligence cases. The South Africa CPA only came into effect in 2011 and there consequently very little case law available in South Africa. The CPA in India however came into effect in 1986, allowing many decades of maturation. If this maturation is at all prophetic, and South Africans start using the CPA in the litigation of medical negligence matters, (with its much “lighter” focus on fault) I believe that the sutures holding the already deep and septic wound together would burst causing the whole system to exsanguinate. 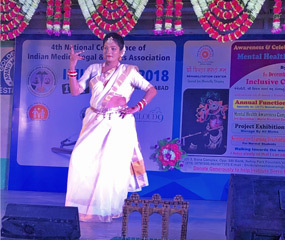 In the evening, after the first day of conference we were entertained by dancers featuring some of the “specially abled” children in beautiful coloured costumes perform dances ranging from classical to contemporary. I was so humbled, and thank the IMLEA for this very memorable experience. The following day I met Advocate Ameet Deshpande, who was going to give his presentation before me, on criminal liability in medical negligence matters. Again I was dumbfounded at the degree of peril further condemning the medical profession in India. In South Africa, doctors would perhaps be called to appear and give evidence at inquest hearings but there is very seldom a criminal conviction of a doctor as has been the case in India. 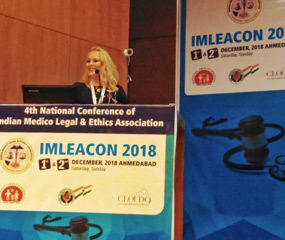 A recurring theme and guidance to the delegates at IMLEACON was that the doctor must strive to always perform his service to the best of his/her ability: Constant striving to mitigate medico-legal risks; improve circumstances in which doctor’s need to work; face and deal proactively with physician burnout, PTSD, addiction and depression; and educate and support fellow practitioners is all that can done. 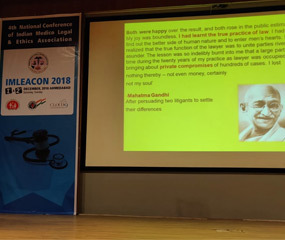 In concluding, I would like to thank Prof. Rajesh Shah and his family, the organisers of IMLEACON as well as the delegates for being so generous with your kindness. I look forward to seeing you again soon in India. I would also like to thank Dr Satish Tiwari for the copy of his co-authored textbook on Medicolegal Issues, as well as Drs Alka Kuthe and Rohini Deshpande for their advice and generosity of friendship. I look forward to working with them in the future to assist in the training of South African Gynaecologists in laparoscopic surgery techniques. Lastly, thank you SAMLA for making this incredible learning experience possible. India is an exceptional country and I hope that we can continue to learn from each other.